The morning sun illuminates with its golden rays the richly decorated facades and makes still noticeable the spirit of once more glorious times. The splendid Imperial Seaside Resorts’ villas, with their pillars and towers, seem to be like carved sculptures. Like dreams – built out of sand and stones. The names of Ahlbeck, Heringsdorf and Bansin stand for beauty, luxury and exclusiveness. Just as pearls adorn a neckless, the longest promenade in Europe is edged by the extravagant summer residences of the Berlin High Society of the outgoing 19th and the beginning 20th century. These residences all together form a worldwide unique ensemble of Seaside Resort architecture. A walk from one pier to another is like a journey in time. A journey back to the beginning of the bathing culture, to a time, when it was chic to stroll along the promenade in elegant clothes, where already at that time, exactly like today, it was in “to notice and to be noticed”. “…The room I’m living in is nice and spacious – the house itself is delightful; looking through the trees at the grey sea is poetic and infinitely pleasant for your heart and senses. It’s quiet here, there is fresh air, and these two things have the effect of a miracle and they fill up your nerves, blood and lungs with a silent joy…”. 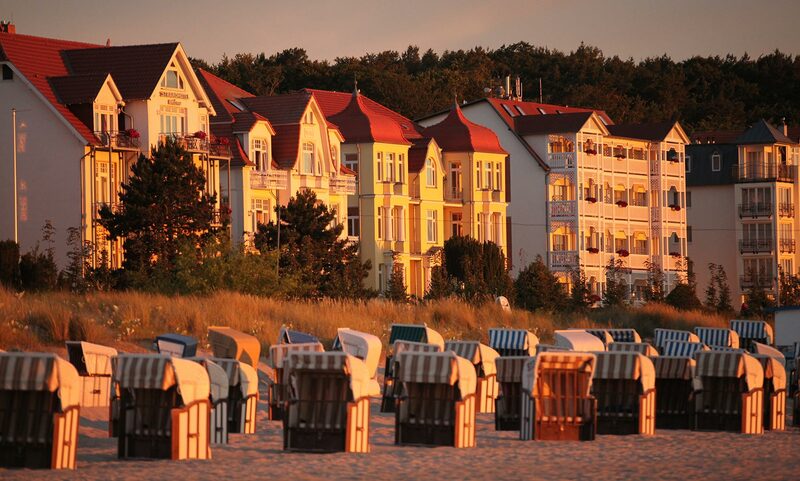 That’s how Theodor Fontane described the special charm of the Imperial Resorts.